The Farm Award rewards businesses which have been making a steady and consistent contribution to the landscape and environment for a number of years, or those who have changed their management practices to make a real difference to the environment. Lynbreck was selected by the judges for a number of reasons. Their fresh approach to crofting has been widely regarded as a model of sustainable farming. Lynn and Sandra have developed a rotational grazing system which has allowed them to get the maximum amount of productivity from their grassland while retaining a diverse mixture of species. Lynn and Sandra are helping to improve the species and habitats on their farm. Although they are new entrants, Lynn and Sandra’s enthusiasm had led to them being nationally recognised as an emerging force in holistic management and quality food production. 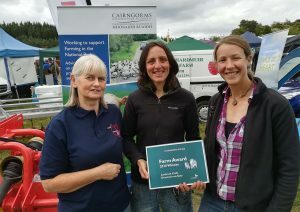 And it was Lynbreck’s commitment to quality; high welfare food production that stood out to the judges. Malcolm was selected by the judges because of the brilliant work he has done with the Butterfly Conservation Trust to safeguard one of Cairngorms’ rarest species, the Dark Bordered Beauty moth. The farm is one of only three locations in Scotland for this species (all of which fall within the Cairngorms National Park) and careful management is crucial to maintaining the species at Auchernack. Malcolm has also helped improve the health of his aspen stands, one of the most important tree species in the National Park. Through planting and careful grazing and fencing Auchernack Farm has allowed its aspen stands to naturally regenerate and provide a habitat for other species. The farm also supports a number of other rare and localised species; Kentish Glory, Northern Brown Argus and Narrow-bordered Bee Hawk-moth. Malcom has done all this conservation work alongside running a successful mixed farm. Ruthven Farm is a 300 Ha mixed livestock farm situated in the River Avon catchment in Glen Conglass near Tomintoul and is tenanted by Jim Simmons and his family. Ruthven Farm has a history of agri-environmental work since Mr Simmons took the tenancy in 2006, including; 2 schemes through the Scotland Rural Development Programme (SRDP) (2007 – 2013). 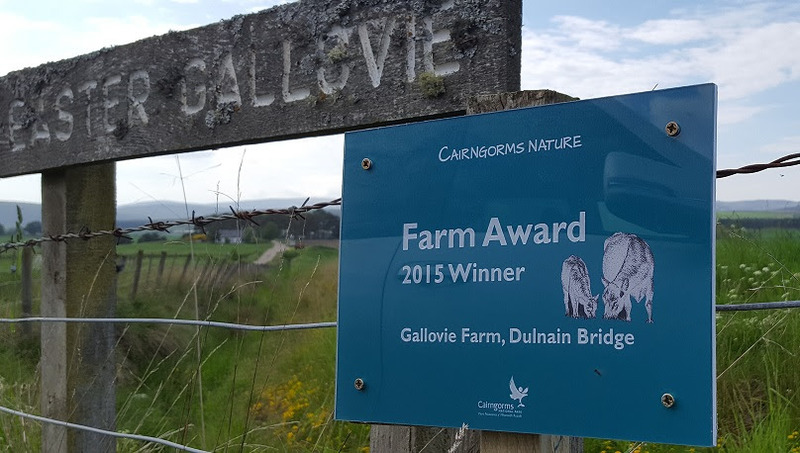 Through these schemes, the farm undertook management options including those which benefited a variety of key species and habitats highlighted in the Cairngorms Nature Action Plan. 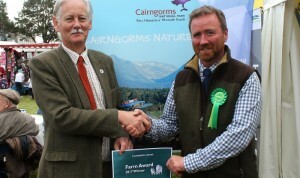 Jim was awarded the 2016 Cairngorms Nature Farm Award as recognition of his unique approach to integrated farm management. This included the use of his farm woodlands to provide shelter as well as the massive amounts of woodland creation, for habitat, for shelter and to ease the effects of flooding further downstream. As well as that, Jim has provided wet feeding sites for wading birds on the farm. Gallovie is a 250 Ha mixed livestock and arable farm on the banks of the river Dulnain near Grantown-on-Spey. The farm is run by Neil Gordon and is a successful commercial unit. Easter Gallovie has been an important part of the RSPB Wading Birds Survey for the past 10 years and has been identified as an important breeding site for wetland and wading birds. Neil was awarded the 2015 Cairngorms Nature Farm Award as appreciation for his hard work and dedication to providing a wonderful habitat for the Cairngorms. Nationally important population of breeding waders. Neil’s work, through ditch re-profiling, creating wet feeding sites and improving habitats has been so successful, wading bird numbers have more than doubled on Easter Gallovie in the last 5 years. If you would like to nominate yourself or someone else for the award, then you can do so by filling out this electronic form. If you have any questions about the award, or how to nominate someone, please get in touch.